Hoppy Run is an endless running game, where your hoppy character hops on tiles and runs through various obstacles. Your aim is to improve your character by collecting coins and purchasing upgrades, and finally, running and hopping with it as much as you can. Controls of Hoppy Run are quite easy. 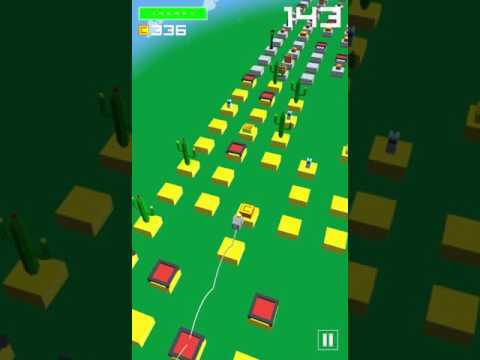 Your character runs forward automatically, you only need to swipe left or right to make your character avoid obstacles. •	Coins: Currency of this game. You will need them if you want to hop and run for a long time. •	Obstacles: Tree, snowman, garbage bin, sandcastle etc. Hitting one of them means game over for your character. •	Fake Coin Trap: These things look like coins, however you can tell it apart from the real one if you look closely. Trying to collect those ends up with your character being locked up. •	Punch Box: There is an arrow on top of the punch box that indicates the direction of the punch. If you step on the tile that is indicated by the arrow, the punch will send you to oblivion. •	Trampoline: These things will make you hop higher than before! You can also avoid gaps and obstacles by using trampolines. •	Fast Power-Up: The only power-up in the game. It will make your character run faster, and resistant to all kinds of obstacles. •	Coin Value: Increases value of collected coins. •	Coin Chance: Coins will appear more frequently. •	Energy: Your character can store more energy that enables it to run further. •	Food Energy: The energy gotten from foods (apple, hamburger etc.) will give you more energy. •	Fast Duration: Increases duration of fast power-up. •	Fast Chance: Increases chance of fast power-up to appear. One last thing! There are many missions in Hoppy Runners! By completing these missions, you earn coins and score multiplier rewards. The more missions you complete, the faster your score increases. * Internet access may be required. This application contains optional video advertisements that can be viewed to provide you additional rewards. Additional data charges may apply if roaming or not connected to Wi-fi.